There is a huge fad these days that completely focus on getting organized. That is so great. Being more organized is the best way to ensure that life moves smoother and can really help keep your life and schedule more simple. But there is a problem when people forget the first step in organization: decluttering! You can buy every single organizational tool on the planet but if you are only using these tools to help organize clutter, then you are getting it all wrong, my friend. The best way to start organizing is by clearing away the excess stuff in your life. You could have the best day planner on the market, but you’ll never truly be organized if you over-book your schedule and don’t have enough time to do all the things. The same goes for the clutter in your home. Decluttering has got to be the first step in the organization. The less you have to manage and maintain the easier it will be for you to continue staying organized for years to come. So where can you get started when you’ve only got 10 minutes? If your kitchen looks anything like mine used to, then there is a good chance that you have doubles of everything in your kitchen! Maybe you have 3 different spatulas, 2 different soup ladles and 5 can openers — 2 of which have been broken for years. Whatever the case, and whatever the clutter, the kitchen is always a good place to start. Take 5 minutes to go through your utensils and get rid of any doubles that you have. Toss them into a box and bring them to Goodwill. They are someone else’s problem now. Once you have cleared through your multiple utensils, it’s time to turn your attention toward those 8 billion Tupperware containers that are taking over your cupboards. I know they’re there. Depending on how messy a situation you’ve got, you may need a bit longer than 10 minutes. Let’s be honest. Go through as quickly as you can and try to match lids to containers. If there are any that don’t have a “partner” it’s time to toss them. Here is a guide to what can and cannot be recycled. I personally donated all of our old plastic food storage containers and purchased high quality, glass containers instead. This is a better option for the environment and for my family. Maybe you are a crazy mini-hoarder who loves to collect hotel shampoos or maybe you’ve just managed to accumulate far too much hair product throughout the years. Whatever the case, chances are you have a ton of unused and maybe even expired product sitting your bathroom cupboard. 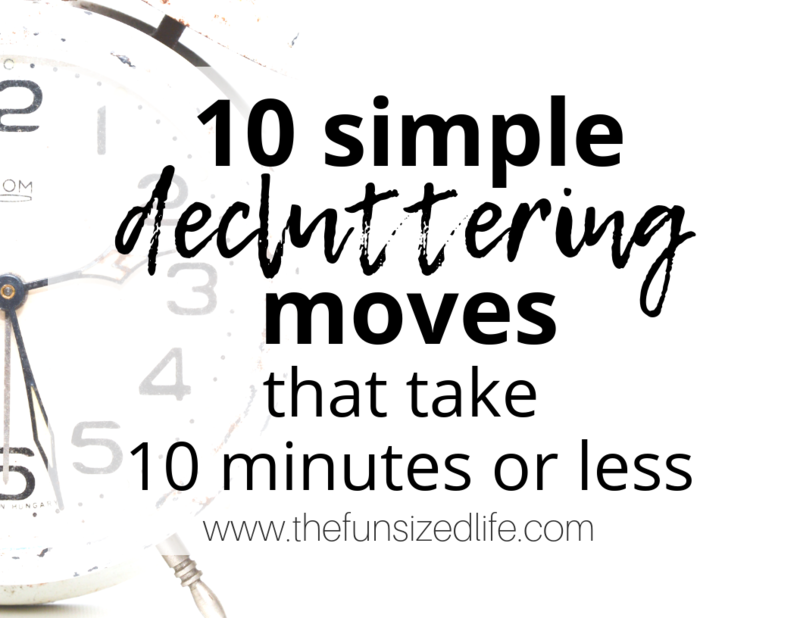 Take your 10 minutes to declutter this space by tossing out anything you haven’t seen or touched in the last few months. A great way to avoid letting this space get over-cluttered again is to use stackable storage. This is a great way to keep travel sized items together, essential oils separate, and small things like bandages and nail polish organized. Use up all shampoo, conditioner, and lotions before purchasing more. At the end of the summer throw away any sunblocks that will expire before next summer. Ok, I know this one could be up for debate. Some parents have no problem tossing their kid’s old toys and others would never dream of it. Personally, I am somewhere in between. Over the last few years, I have become a bigger and bigger fan of non-toy ideas for my kids. Even though I prefer to give them life experiences in place of toys, that doesn’t stop other people from filling my home with stuffed animals and figurines. More often than not I include my kids in the decluttering process. I hand them each a bag and tell them to fill it up with unused toys. But I’m also a mom and I know that sometimes patience is in short supply. *Bonus mom tip. If you make Goodwill donations do it immediately and when your children are not looking. Create a capsule for toys. Put some away in large storage containers and switch them out throughout the year. This is a great method for keeping toy clutter at a minimum while also avoiding the guilt of getting rid of something they might really love. Get in the habit of decluttering toys before birthdays and Christmas in order to stay ahead of the chaos. Paperwork, bills, coupons, newspapers, magazines…these are all things that can take over your house and create major clutter before you even know what’s happening. So take 10 minutes and head to the biggest paper cluttered section in your house and just start chucking. You can start by recycling old coupons, newspapers, and magazines (make sure to remove staples.) When it comes to filing bills and other important papers, take this time to file them away as efficiently as possible. You could also make this process even quicker by setting up a paperless home system in your house. Get a command station set up in your kitchen for all new papers and coupons to go into to keep things off the counters. Time to head to that closet and get real honest. If you haven’t worn something in over a year, get it outta there! So often people hang on to clothes that they hope to fit back into or are worried they might need again. Take 10 minutes to get honest with yourself about the clothes that are not being used and put them in a donate pile. Getting rid of unused clothing items (especially if they haven’t fit you in years) can be a very freeing experience. Holding onto items like these can hold us back in so many ways and keep us living in a state of guilt and sadness. If you have got 10 minutes I would strongly encourage you to let go of all of this and just be done with those unused clothing items that are holding you back. Avoid going on shopping binges. Try using a capsule wardrobe to keep a clutter-free closet all year long. Another great idea when it comes to keeping your pantry decluttered and well organized is to make sure you check what you have before you go grocery shopping. Making sure to use all the food you have in your pantry is a great way to keep it clean and help you stick to your grocery budget. Use up as much food as possible before heading back to the store for more. Know what you have in your pantry to avoid buying the same items. Stay up to date with expired food. The name itself implies that this really shouldn’t take too long! I mean, it’s the junk drawer. It’s full of junk. This is true yet, it is crazy to me how long I can talk myself into hanging on to some random doohickey that is in my junk drawer. With absolutely no idea what the purpose, I will hang onto something for years out of fear that one day we will realize that doohickey could have single-handedly cured cancer. Since the chances of that are slim, just do yourself a favor and start chucking. Keep your basic scissors, a few pens, and that Scotch Tape. Beyond that, be honest with yourself, grab a garbage bin and just start dumping. It’s crazy how motivating clearing a junk drawer can be especially when you declutter and then organize it. Sometimes 10 minutes decluttering the junk drawer can lead to decluttering the entire kitchen. I have none. The junk drawer just seems to be one of those places that… accumulate junk. Go through it frequently before things get really out of hand. While I’m sure you have nothing secretly hiding under your bed like you did when you were a kid, it might be worth a look anyway. Any old items that you shoved under there and completely forgot about? If so, do yourself a favor, take 10 minutes and donate or toss it. Often times when people find something in their homes that they completely forgot existed they act as if they just opened a new present. In reality, looking at these items should be a reminder that you must not have needed them to begin with. Maybe you are totally innocent when it comes to under-bed chaos, but I’m willing to bet your kids aren’t. If you’ve got time to spare, take a peek under all of the beds! Get organized under the beds. Welcome to my favorite things to get rid of. While I love great movies and a good book, sometimes I have to be honest about when I’m not going to use either. Clearing these things away is even better when you can ship them off at the same time and then get a check in the mail. Decluttr is a great way to clear through old electronics and books. You simply download the app and scan each item’s barcode to find out how much Decluttr will pay you for each item. Ship your items to Decluttr free of charge, sit back and wait to get paid! It’s so simple and can literally take less than 10 minutes! Read more. Don’t buy movies, books or games unless you know you will get used out of them. You can always consider streaming, using the library or other rental services. Once you have finished a book, donate it to your local library. Having a clean car, especially if you are driving a lot, can completely transform your mood. Take 10 minutes to put away any items left in the car, throw away old fast food garbage and do a quick wipe down of the interior. If you really want to go above and beyond, you can bust out out the vacuum and then head to the car wash.
Because vehicles are something that always loses value, it is so important to try and make them last as long as possible! Put a Dollar Store garbage bin on your passenger side to avoid garbage build up. Store any extra things (like blankets and flashlights) in a container in the trunk. Make a habit of bringing everything in with you at the end of the day. Remember after the decluttering process comes organization! Once you have less to work with, you’ll gain more opportunities for the clean organization. If you need some extra ideas on how to stay crazily organized all year long, check out my Pinterest board filled with great decluttering and organization ideas. This paragraph is like, life truth man: “You can buy every single organizational tool on the planet but if you are only using these tools to help organize clutter, then you are getting it all wrong, my friend. The best way to start organizing is by clearing away the excess stuff in your life.” So. Darn. True. I find sometimes the hardest part is just getting started. Thanks for sharing this post — I seriously need to buckle down and start organizing again. I always feel like I’m all over the place! Speaking of car, I haven’t organized that in a long time. Argh!! !